Cathy Young stands on a narrow strip of beach. She tells her audience, six kids from Philadelphia, that she sees something really special. Can they find it? Ten-year-old Charlotte Wiant spots it first: a black, porous object the size of a grapefruit that's flat on two sides. The other kids gather around to see what Young explains is a fossilized whale vertebra. In a few days, most of the children will return to elementary schools where, if they're lucky, they'll have a weekly science class. 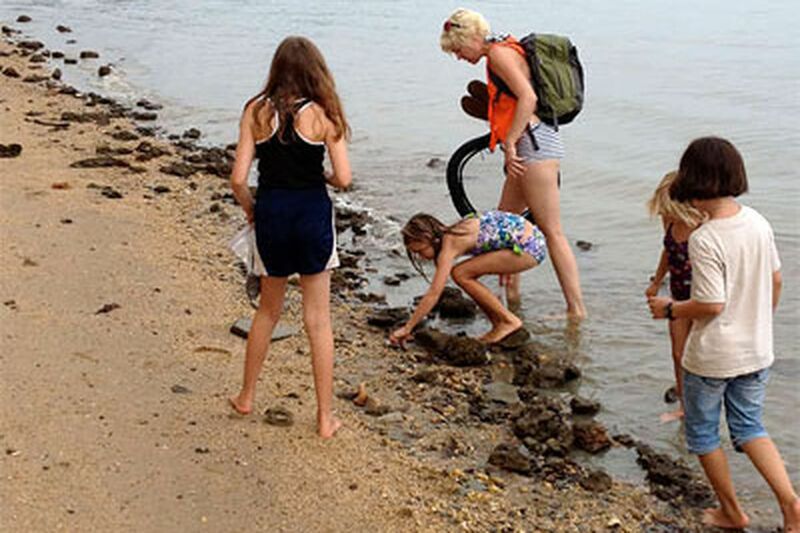 But out here on the bank of the Potomac River, Young, who leads dozens of trips each year with her Berwyn-based company Mid-Atlantic Fossil and Nature Adventures, is hoping to help them really fall in love with science. "The best way to learn is by doing, rather than just sitting there reading a book," she said. It's no accident that Young, who started organizing trips through the Academy of Natural Sciences more than 10 years ago, is one of a growing number of teachers offering educational extras to school kids. Whether it's a beach getaway or extended textbook time at the end of the day, more parents are engaged in a practice called "afterschooling," trying to reteach the same subjects their kids are learning, or not learning, in the classroom. In many ways, it's not a new idea. Education at its best is a partnership between schools and parents. But the trend toward afterschooling - an offshoot of homeschooling - has parents taking a more active role in teaching their kids. When Quakertown seventh grader Lauren Bruge was having trouble with math at school, her mother, Barbara Gini, used cooking and shopping to teach math at home. "She understands these math concepts much better now than when she was just doing a worksheet," Gini said. That's the philosophy behind afterschooling, which takes some of its inspiration from the writings of Susan Wise Bauer, a well-known home education advocate from Virginia and the daughter of homeschooling pioneer Jessie Wise. "Classroom education has tended to become more and more focused on getting specific test results and mastering certain specific sets of information," Bauer said. Her methods borrow from classical education, which focuses on teaching students how to think rather than how to regurgitate facts. What may sound like an indictment of schools is not, Bauer said. "Often a kid is in a classroom, and it's working well except for in one or two areas," she said. "That's not a failure on the part of the school. It's just the reality of how kids develop. They do it unevenly." Afterschooling takes many forms, and differs from traditional extracurricular activities like soccer and dance because it's more academic in focus. Steve Pyne and Pam Nelson's children attend the Philadelphia School on 25th Street in Center City. They use family vacations to supplement their children's school-based education, either through Young's science adventures or by visiting living history museums. Laurie Segal, whose sons attend the Crefeld School in Chestnut Hill and Sadie Alexander School in West Philadelphia, teaches her kids geography and music on trips, like when they played bluegrass recordings during a car ride through Tennessee and Kentucky. And Greg Conti, a single father in Wayne, regularly takes his 12-year-old daughter Isabella to hunt for fossils and gems. For the first time, Kelly Dixon, who teaches science classes to teenage homeschoolers in Abington, has one school-going family attending her classes this fall, and she's getting more inquiries from other parents. Many afterschoolers use computers and online resources to teach their kids. Aaron Walsh, a parent and educator in Boston, is an advocate of immersive education, which uses virtual reality technology and video games such as Minecraft, Portal, and Little Big Planet. Walsh describes the private Catholic school his children attend as "adequate." "No school can reach everyone's potential," he said. "My job as a parent is to augment their formal schooling to help them reach their full potential." Sometimes afterschooling is motivated by competition - among parents, that is, wanting their children to be the best. Jane Dmochowski, a mother of two in Mount Airy, remembers being lectured by another mother at a party about using tutors to groom a child for admittance to Masterman. Dmochowski's oldest child was barely out of diapers at the time. "They want to make sure their kids stay at the top of the class," said Hilary Levey Friedman, a sociologist who researches childhood and education issues. She studied families in the Princeton area who send their children to math tutors. Reading is typically another hot-button issue for afterschoolers. Amy Firestone, who afterschools her 13-year-old son, R.J., runs the website afterschoolers.com, which has seen traffic increase steadily since its launch in 2007. She said some parents teach their kids to read at home because "many schools have abandoned the idea of sounding words out." One parent in University City, who asked not to be named, said she taught her children to read using phonics before they started kindergarten to protect them from the school's instruction methods. "I wanted to teach them to read properly, so I was kind of immunizing them before they went into kindergarten," she said. The movement has some educators worried about its effect on children. Kathryn Starke, a literacy specialist in Richmond, Va., thinks afterschooling is overkill. "Since kids are in school for seven hours a day, excessive homework and afterschool reteaching are not always necessary," she said. She called some parents' afterschooling attempts "drilling and killing," and said she didn't think kids receiving extra afterschool instruction had an advantage in school. But home education expert Bauer said that "a lot of parents are afterschooling because their kids are bored." In such cases, afterschooling doesn't overburden kids but instead provides much-needed challenge they're not getting from their schoolwork. Lauren Bruge, the seventh grader whose mother used cooking to teach math, said the games they played didn't feel like extra homework. "It just felt like hanging out with my mom." For most families, afterschooling is mostly a means to have fun with their children. Michelle Shelderfer of Malvern takes her son Jayden, 8, on Young's fossil trips because it gives her a way to spend time with him. When Walsh, whose son recently made him a virtual birthday cake using Minecraft, sits down at the computer with his children, they "don't realize that they're getting a lot of benefits that are educational. They just want to play and have fun."